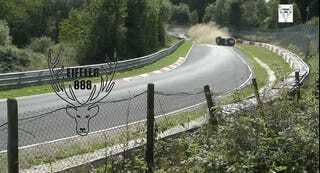 The Nürburgring Nordschleife; a treacherous track that has chewed many a driver’s car to a gnarly pulp. The unfortunate driver of this now-pile of broken Porsche is John Shoffner from J2 Racing, but luckily, he came out of it all OK in the end. 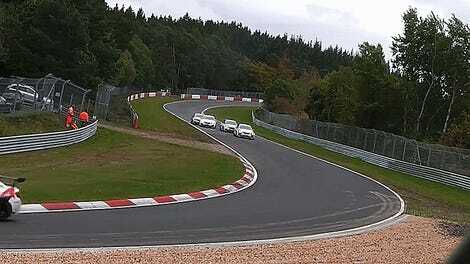 Racing in a recent VLN event, Shoffner’s 911 GT3 Cup was barely out of the Flugplatz straight before it hit a patch of grass and lost control, reports Carscoops. The Porsche flips a heck of a lot, and it goes so fast that it’s hard to get a definite count. The 911 took more than 10, and probably somewhere nearer to 15, tumbles before it settled on its roof. Shoffner was raced to the hospital, but amazingly, came out of this epic wipe out with no major injuries thanks to a tough, modern race car roll cage.